Every language has a responsibility of enhancing communication between people. To enhance this each language has got its own word classes. Among these classes are verbs, noun and adjectives. Verbs are doing words. They explain an action, occurrence or state. In a sentence, they are the main component of the predictor part. Verbs can be in the present tense, past tense, future tense. In Portuguese, there are verbs too. Though they might sound different in pronouncing the spelling is similar. This makes it easier for one to understand them if he/she understands English well. We want to know how to learn Portuguese verbs. In the Portuguese language, we have three different classes of verbs. They are classified on the bases of the last two letters of the word. These classes include “ar”, “ir”, and “er”. When conjugated each class has its own pattern of ending. when conjugated verbs in the present tense that end with “ir” and have the vowel “e” in the second last syllable have their root changed. The vowel “e” changes to “i” only for the first person. This does not even apply in the popular form. When conjugated verbs in the present tense in Portuguese ending with “ir” and have the vowel “o” at the second last syllable change root. The same happens as that of “e” only that “o” here is substituted by “u”. this only happens for the first person form. Example, (dormir means sleep and eu means I ) but it changes to Eu durmo. Let’s now look at the present continuous tense. these refer to the actions that are taking place right now. To construct a sentence in the present continuous tense in Portuguese you need a person, present tense verb estar conjugated according to the person being referred to and the action going on right now. In Portuguese “ing” is written in three ways, depending on the last letters of the verb. if the verb ends with “ar” the “ing” is ando , if it ends with “er” is endo, and iif its “ir” is indo. Example, falar (speak)-falando (speaking). We move on to irregular verbs. It is a group of verbs that don’t follow the typical patterns of the language they belong to. 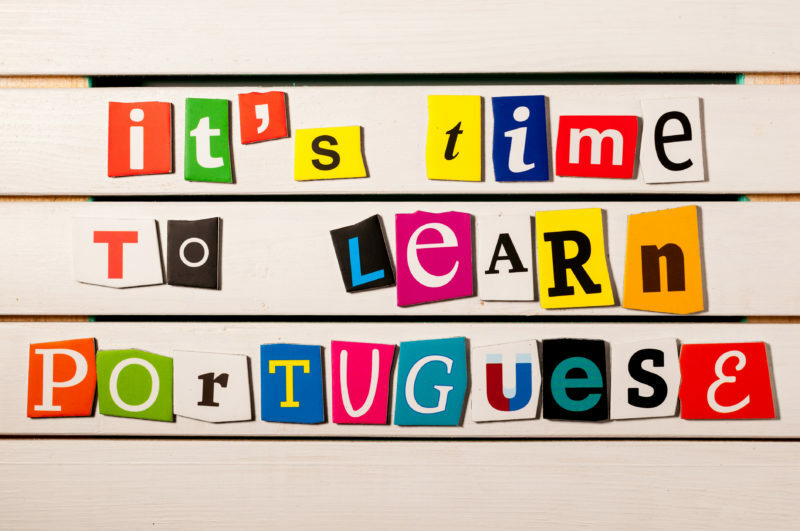 When it comes to learning irregular verbs in the Portuguese language it is better if you memorize each and every one of it. this is because they lack a pattern of identifying them. The principle of simple present conjugation can be applied since the persons are always regular. Simple verbs have the same changes as those of the derived form of verbs. Examples; obtain, keep and maintain. Next is the future tense. These are the verbs that are used to describe things that will happen in the future. They are either in simple or compound form. When it comes to simple future tense we get only to use only one verb, that is the main verb. Has noticed from the above study, verbs I Portuguese end wit three terminators ‘ir’ ,’er’ and ‘ar’. Those in simple tense are replaced by ‘ira’, ‘era’ and ‘ara’ respectively in singular form sentences. In plural, they are replaced ‘irao’, ‘erao’ and ‘arao’ respectively. Future compound tense is mainly used in Brazil. It involves two verbs, one is the main verb and the second is the auxiliary verb. The terminators used here are the same as those used in the future simple verbs. Terminators like those of future simple tense replace the roots of the main and auxiliary verbs when conjugating them. This is done according to the tense. We move on how to learn Portuguese verbs which is used under many circumstances in the English language which is not an exception to the Portuguese one. This verb has a singular form which is has. In Portuguese it is written as “ter”. “ter” is used to show possession. It can be used in a sentence to show someone possess something. Example, Eu Tenho um cachorro. (I have a dog). It can also show someone has responsibility to do something. Ela tem que limpar a casa. (She has to clean the house). The other group verbs are the verb imperfection. It happens that it there are only two tenses that show or express an action that took place in the past. In the past tense passado perfeito, we only deal with occasions that had just recently happened or that just happened. This also includes simple past, which includes actions in the have definite beginning and a definite end. In the imperfect tense we include an action that have no definite time of begging or definite time of ending and actions that are yet to be seen complete. ‘They were….’ is a good example of such sentences. On the imperfect tense we work on seeing that one can get a conjugate that is in the imperfect tense along with the main verb in the simple form from the compound tense using the verb “estar” to be. “Ser” is used when dealing with permanent conditions and characters. It is also a type of verb while “Estar” is used for temporary conditions and characteristics. The verb “Estar” is a conjugation of the verb “ser”. Addition to the imperfect tense is that it describes a person’s past behavior or habit. Habit can be described as a listed number of actions that one repeats many times, imperfection also describes people, places and things. This includes how they look, what is found there and nature. when conjugating regular verbs in the imperfect tense in the Portuguese language you have to keep the root of the substitute verb and substitute terminators. In Portuguese there are two types of verbs, the regular and irregular verbs. Regular verbs a given set of rules all the rules of the while irregular do not follow any rule. Irregular verbs in Portuguese at time seem to contradict themselves knowing this will allow you to learn Portuguese verbs fast . Once you understand the regular verbs, which is easy to, easy and you are ready to go. You get to understand irregular verbs with time. They seem hard at the beginning. Portuguese can be a sweet language if you get to learn fast. it is ranked the sixth most spoken language in the world. It is also recognized as the native language of Portugal.